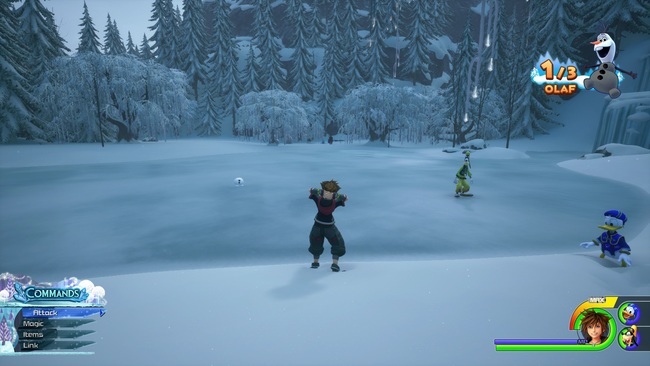 After you reach Arendelle in Kingdom Hearts III, you will eventually have the chance to meet Anna, Kristoff, Sven, and the friendliest snowman ever, Olaf. 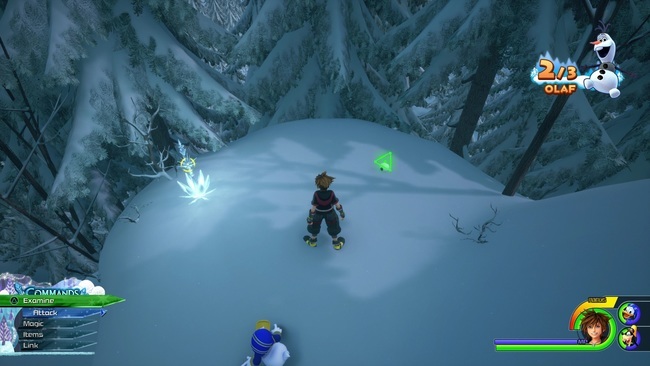 In an extended cutscene, Sora learns more about Anna’s childhood with Elsa. However, Kristoff soon interrupts to reveal that Olaf has fallen apart… again, asking for your help to locate the snowman’s scattered body parts so that they can rebuild him. Essentially, this is a game of hide-and-seek. Olaf has split himself into three pieces, and your goal is to find them so that Anna can put him back together again. Seeing as he’s a snowman it’s not something that they are particularly worried about, although it does keep happening. With that, let’s get started – as on this page we’re going to list the Olaf pieces locations – or where to find every Olaf part – his head, legs and body. Right, let’s find Olaf’s head first. 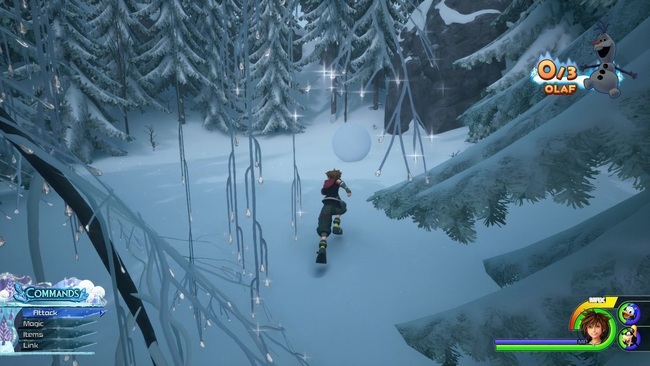 From where you start, run straight across the frozen lake and you should see a snowball between the trees in front of you. Jump on it, and roll the snowball into the rocky cliff nearby to break it open – revealing that Olaf’s head had somehow become stuck inside! After you have recovered Olaf’s head, Goofy will make a bad joke about seeing Olaf’s legs leggin’ it. They’re not too far away, thankfully. Look back to the frozen lake and you should easily spot them wandering around carefree. The legs will run (or should I say skate) away from you as you get near, so be prepared to give chase. When you are close enough, you will need to press the Triangle Button (or Y Button) to grab them. Two down, one to go. Now for Olaf’s body. This is the trickiest to find, as there are a few fake body parts in the area to confuse you (but also result in some funny cutscenes if you do choose to collect them). 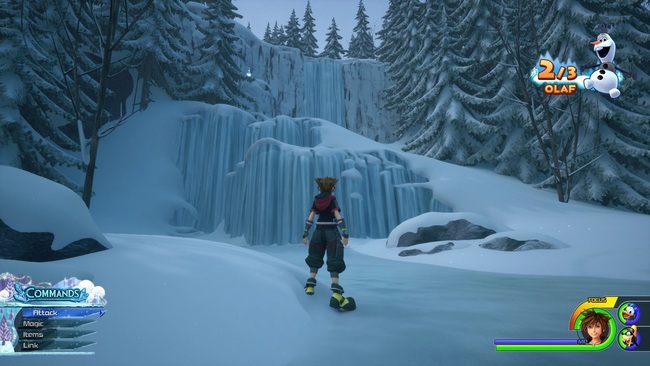 To find Olaf’s actual body part, you will need to climb up the frozen waterfall to the northeast and then turn right once you reach the top. There is an area that you can slide down here, where you will pretty much immediately see a ledge to your right. This is where you will find Olaf’s body has been hidden away.